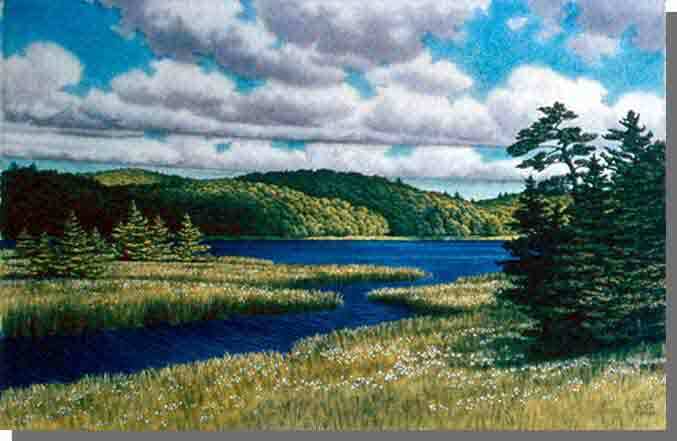 Boggy Lake Wilderness Area is located in the interior of Nova Scotia’s Eastern Shore, north of Moser River. Expanded in 2015, this wilderness area now protects close to 4,680 hectares (11,560 acres) of exceptional woodlands, lakes and river. Numerous, rounded, elongated hills are scattered throughout, often separated by lakes or waterways. These well-drained hills, known as drumlins, consist of glacially-derived material (till) and support impressive hardwood and mixed conifer-hardwood forest of mature to older sugar maple, yellow birch, and red spruce. Conifer forest covers the surrounding, well-drained hummocky terrain. This wilderness area protects a representative portion of the Eastern Shore (Moser River) Drumlins Natural Landscape. At its northern extent, the wilderness area meets the adjacent Alder Ground Wilderness Area at Liscomb River Road. To the west, it meets Toadfish Lakes Wilderness Area. With other protected lands in this part of the Eastern Shore, these lands form a provincially-significant assemblage of protected river corridors, lakes and woodlands. This helps protect aquatic habitat and expands corridors of natural forest used by many species for travel, feeding and shelter. The area offers exceptional opportunities for canoeing, camping and angling in a wilderness setting. Primitive portages enable lake-to-lake canoe-tripping between Middle Lake and Long Lake, via Boggy and Square lakes. Moser River can be paddled at high water. Various lakes are popular for angling. The old Liscomb Game Sanctuary warden cabin at Long Lake is open to public use; it has a wood stove and bunk beds for up to eight persons, but no mattresses. The area is suitable for off-trail exploring, especially on the drumlin hills and along some old woods roads/cart tracks; however, no managed hiking trails exist. Northern portions of the wilderness area are within Liscomb Game Sanctuary, which limits hunting to muzzleloader, bow or crossbow. Several campsite leases occur within the area. Boggy Lake Wilderness Area can be accessed by vehicle via forest access roads around the perimeter of the wilderness area. Access points include drive-to boat launches at Bear Lake, Round Lake and Long Lake. The boat launch at Middle Lake is accessible by short trail from Liscomb River Road. Check road conditions before planning a trip.